It's exhausting being on the bleeding edge because, duh, you bleed. To make matters worse, I'm working in a gray area, and it's difficult to find my way in all this fog. You could say I'm a self-publisher, but my imprint LaPuerta has published several titles, including some by other authors. And we've also packaged books and even entire series for other publishers. So, as I say, I'm tooling along in the gray area, not ready to play among the big boys but not exactly flogging my first memoir. One of the many paradoxes of the legacy publishing world is the long lead time required by the media if you want to garner advance reviews for a new release. This traditional model used to apply mainly to hardcover books, then shifted to trade paperback as costs of printing and returns shot up. It's possible for an ebook to have a delayed release, but you see this mostly when it's in coordination with paper book versions. If a book release is ebook only (as I notice Dan Poynter now advising), the market seems to favor "instant" publishing and reviews after the fact. Book-review bloggers and podcast hosts, for example, rarely insist on receiving advance copies. Yes, it may take them four to six weeks to publish a review, but they don't expect you to withhold publication during that time. So now I'm publishing my third Rollo Hemphill misadventure Farnsworth's Revenge after promising it to bookstore audiences since about 2007. (This one rounds out the series, and you don't need to have read the first two.) I decided on a conventional trade paperback release with the customary advance review cycle. So even though the paperback was production-ready back in November, I set the release date at April Fool's Day. Meanwhile I did a 20-copy Goodreads Giveaway program just before Christmas. More than 500 people entered the drawing, and of those more than 200 marked the book as "to-read." It seemed a shame to make those sweet folks wait so long. So I'm borrowing from Hollywood and staging a sneak Kindle preview to my thousand closest friends. No waiting - but to keep faith with our press releases, the ebook will disappear in a few days, only to re-emerge after the paperback release date in early April. 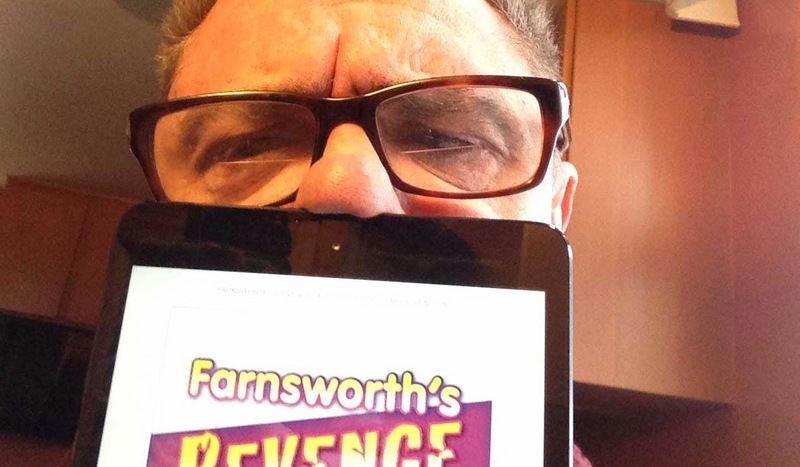 READER ADVISORY: Among other nefarious elements of the plot, Farnsworth's Revenge reveals certain secrets of cold fusion. You'd better click through to get it now. You might not remember to do it tomorrow, and you never know when the Secret Government may shut us down.